I'm Jess, just joined the other day. A dealer close to me has had a 750 for about a year. I showed my boss (at the time) and we geeked out over it for a while; it's nice to have a friend who feels the same way about 80s sport bikes. A few weeks ago I saw it was still listed, and today I ended up in the area and checked it out. I ended up putting a deposit on it so I can go back to them with more thorough questions and see what else I need to figure out. If Thursday isn't disgusting I'm going to see if I can head down and take it for a spin. If all goes well, then Saturday morning is the day. Phew. The bike was on a battery tender when I got there, and I was there randomly since I am never in that area so I didn't get to ask all the questions I was compiling. etc, etc. It will be my first Duc, right now I've been on a Ninja 250 for a few years and have taken it to a few novice track days. Really getting to open it up has been awesome. The 750 seems to be a good choice for the curves and bends we have in my neck of the woods, I don't need anything that goes too fast. My Ninja is totally bullet proof and seriously forgiving. So it will be fun to get on something that will force me to have my head about me. I'll post some pictures below but I suppose I'd like to pick yer brains about the dry clutch and some other things. It may be me overthinking, but I'll get right to it. - I tend to always be engaged in first gear when stopped, even in traffic unless it's packed and not moving, at which point I usually shut the engine off. Is this ok to do with a dry clutch or should I keep it in neutral when stopped? - I read a lot about dry clutches being a bit finicky getting into neutral. When I'm in my car I will usually lift off the clutch until it begins to catch, then shift+clutch to get into neutral. Is this effective for this as well? - As far as valves, carbs, electric goes. Is there a way for me to tell if they have been upgraded (just by looking, or maybe taking some plastic off)? I looked through some of the older posts but didn't really find anything. I'm not a total gear head, but my eyes are basically seek and destroy if I know what I'm looking for and at. 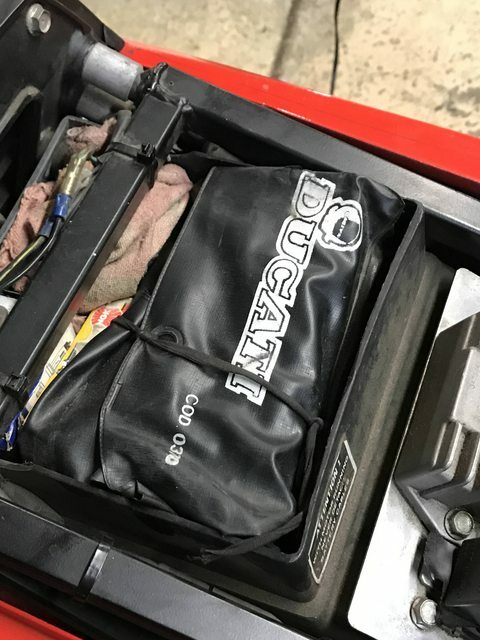 - Anything else a newb Duc rider should be aware of? Esp for a 30-something? Will it want to sleep as much as I do?? - What are some other pictures I can take that would be helpful if I do need some troubleshooting (some of the ones I have now are at really weird angles, I was excited, go figure). - Would it be wise to take it to a Ducati dealer and have them do a look over? The dealer now is a Kawasaki dealer, but has a mechanic who has a few Ducatis so he worked on it. I've been using them for a few years here and there, so I trust them as far as that goes. - Sales guy said it would definitely make it the ~40 minute trip home, but said "not two hours" when I joked about taking it to a work function in two weeks... so, is there a limit to how often I should be running it, and should I limit my distance? I have a ten minute commute to both jobs and school. Should I take a longer route so I can warm the engine all the way up before shutting it off? - Anything else I should note switching from wet to dry clutch? - I'm assuming with the 10:1 compression I'm looking at premium fuel? And should I be using non-synthetic oil? So, what I DO know about the bike is, it had two POs but the first didn't ride it; basically bought it, then sold it. Second owner babied the heck out of it (see below). He was going to ship it overseas but I guess the dealer bought it from him instead. 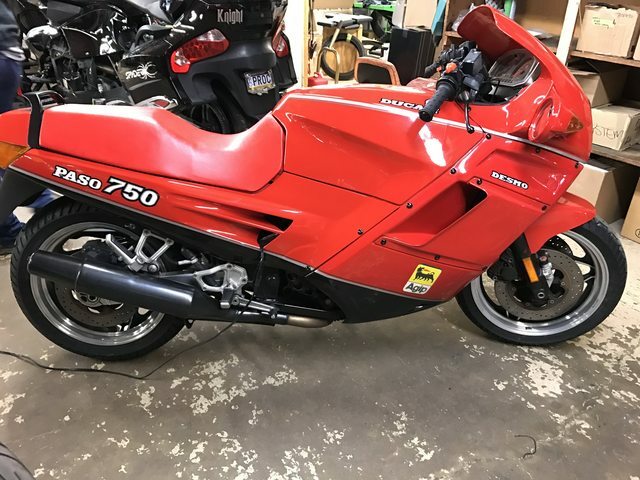 The dealer I'm going through is super thorough, I mean the bike is just so clean and well... the price is kinda what did it for me, I guess. Out the door with temporary tags, title and taxes: $1968.42 How did I do?? imho a Paso is not really the ideal beginner’s bike as the handling isn’t like the one of a Ninja 250 or the CB450S I made my license on but as my Duc dealer used to say ‘if you can ride a Paso you can ride everything’. Even if that’s exaggerated there’s a little bit of truth in it. The Paso is as bulletproof as your 250 if maintained properly and it doesn't take much to do that. There’s no limit to how often you can use it or how far you can ride. That depends on the condition of the bike. That one was ridden 44kmls so it can’t be that unreliable. The dealers concern could be if the bike stood for a longer while or if the last maintenance (i.e. belt change) was done a long time ago. I tend to always be engaged in first gear when stopped, even in traffic unless it's packed and not moving, at which point I usually shut the engine off. Is this ok to do with a dry clutch or should I keep it in neutral when stopped? I don’t see what difference either would make to the clutch. I usually keep a bike in neutral. In traffic it’s because the clutch hand will hurt after a bit and when stopped or parked I don’t want to forget pulling the clutch lever before pressing the starter button like I did once (not with the Paso) especially if the bike is on the side stand. It will jump forward and tip over if you don’t have a quick reaction. Getting into neutral can be finicky if you’re standing still. Once you roll it will be easier. Try switching into neutral before the stop. If it’s really a problem the bike may have a technical issue. The bike looks very original. Since the exhaust cans have the small exit diameter it is a US model in which case it will also have the smaller diameter header. (imo the left silencer seems to be repainted) The US model also had the reflectors on the fork. 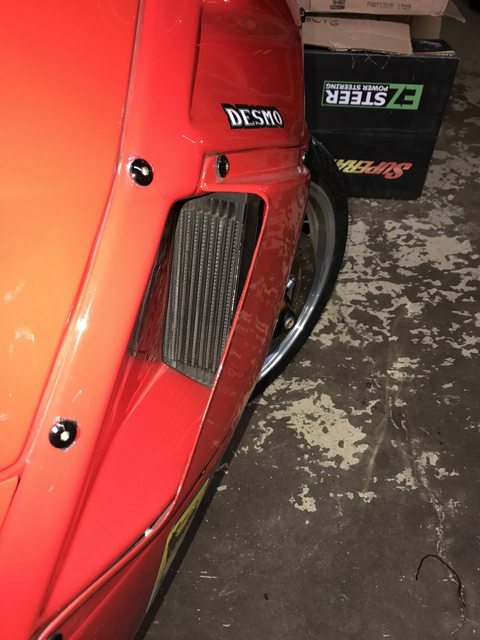 The Euro taillight may have been an upgrade from a past owner. Not sure if the wires in the tool compartment belong to it. However the cable ties indicate that something was done. The vented clutch cover is an aftermarket part. 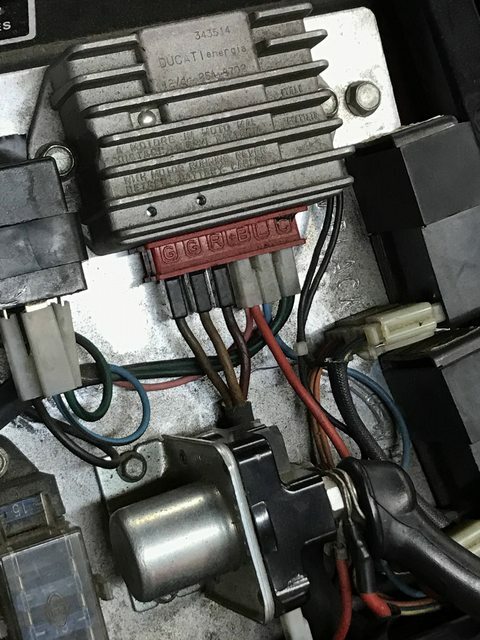 The regulator/rectifier is still original which isn’t necessarily a good thing however there’s nothing showing signs of overheating. The black rubber ring on the forks rebound adjuster is a rarity btw. That’s often lost. You should be able to see from the front if that Paso still has the original Weber and airbox. It does look that way. The tires specially the front one still has the rubber hair but since production stopped over a decade ago those are old and need to be replaced. The handling will improve with new tires. Btw have the tire pressure checked before your test ride. The only two things I noticed in the pictures is that the paint seems to be scratched off on the right fork leg and the vertical lines on the left fork leg which are probably reflections not scratches. I assume that spots higher up are just dust not any surface rust. - Would it be wise to take it to a Ducati dealer and have them do a look over? Yes if you won’t do it yourself and if there’s no documented service history. There might be a service backlog. It’s not only about changing oil, filters, spark plugs, belt change and adjusting valve gaps. The question is if i.e. the fork was serviced or the steering head bearings have ever been checked and greased. You’ll find a list in the FAQs. Btw there are NGK spark plugs in the tool compartment. You’ll be better off with Champions. - Should I take a longer route so I can warm the engine all the way up before shutting it off? yes, with the two oil coolers the engine’s temperature increases slowly. There’s always a little condensation build up in an engine. If it isn’t run up to full temperature at least once in a while that condensation will not fully evaporate. Instead the oil will foam which obviously isn’t good for the engines lubrication. Of course that will happen only over time and if you only do short trips. On a car that will show with white sludge in the oil cap. On a bike a milky oil sight glass will be an indicator. Greetings and welcome! Congratulations! You've done well. Its a really good choice to geek on about: great design pedigree/amazing motor. We are all excited to assist you. 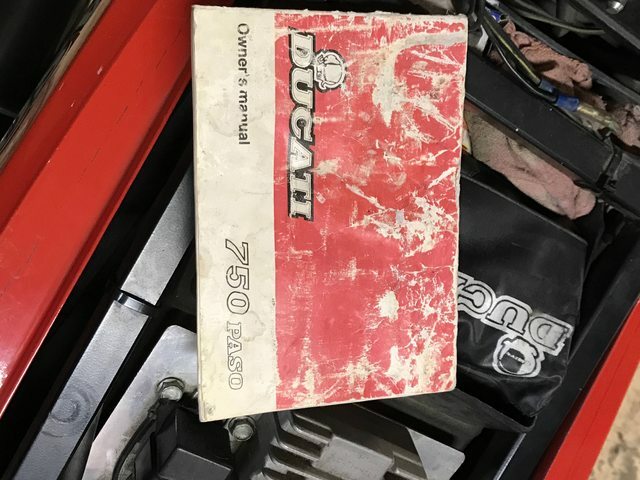 I purchased my '87 P750 for $2K ten years ago probably with more issues than the sweet original you've got. I've also had a Ninja 250 and a Ninja 300 during the time I've had the Paso. You did very well I think. You'll really enjoy getting through an intersection withou wanting to upshift. With a torquey 750 and 5 gears , you can enjoy first gear all the way to the next stop sign. What a difference! I've used the Ninjas for all my commuting because they are so easy to ride and so nimble and light. Plus they get good gas mileage and tires last a long time.I ride the Paso on weekends in the twisties and to moto events. Comparably, it is not as easy to ride, nor is it nimble or light. It doesn't get good gas mileage and it's not as comfortable as the micro Ninjas, but it is so much more fun to go fast on! Can you keep the Kwak for the commute and the Duc for the road less traveled? That way you can keep your new Shinko tires nice and roundy. You'll most likely find that neutral is difficult to achieve at a standstill and you won't want to keep the clutch lever pulled in and engaged in first while at a stop light. 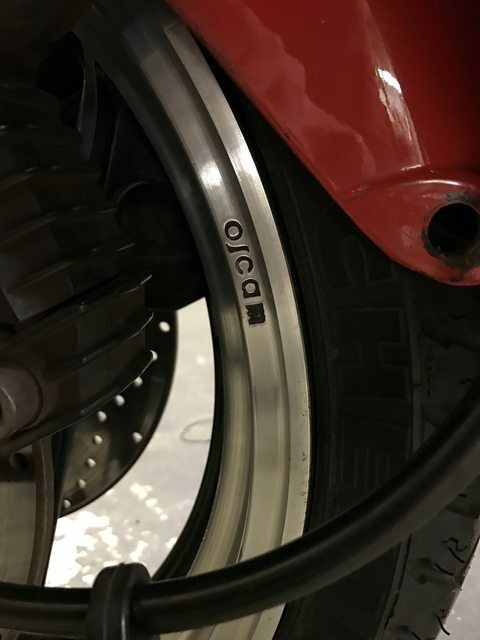 It will certainly put some wear on your clutch plates and it will cramp your hand nor is it really the best way to ride a moto. (IMHO). The Paso750 is easy to maintain and service once you get it caught up in maintenance and fix any issues. Like your Ninja it does not need premium gas: that would be a waste. Put in the mid grade or regular. Fully synthetic oil is recommended by most moto mechanics, but you can also use regular dino juice. Your choice, but change oil often, every 3000 miles should do it. It will be essential to take off all the fairing bits and review the entire bike while you detail it and refurbish all the finishes and surfaces on the bike. Can't wait to see what you do with her! Best Of Luck! Thanks for all the info. You're right, the Paso gets horrible gas mileage. And not to worry, the tires are brand new, I guess Michelin makes one run of them a year in a limited batch? That's what the dealer told me at least.. So far it seems the first maintenance I will need is so upgrade the wiring to the instrument cluster. The clock works fine but the fuel gauge and neutral gear backlight isn't working. Sometimes the light will kick on but it's very rare so I may just order a new fuse too. Everything else in the cluster seems to work fine. I downloaded the wiring schematic from an old post and thankfully the manual has more information. I had a few more questions too..
Is the "off run off" switch on the right handlebar to turn the electrical system on and off? And if the bike is going to sit for a week or more would it be a good idea to disconnect the battery, or would it be better to just keep it on a tender at my job? The storage unit I rent doesn't have an outlet. The tires are not new. They might be unused but they are old just check the DOT number on them. Michelin began to manufacture only one or two limited batches a year around 2002 or 3 and then completely stopped production in 2005. The newest Michelin in existence is 13 years old. Get new Shinkos! For the fuel gauge check the connector below the tank. The neutral light issue could be caused by the switch itself or a contact problem. It has nothing to do with any fuse. The kill switch interrupts the power to the coils & CDI units. The cluster lights are very weak in stock form. 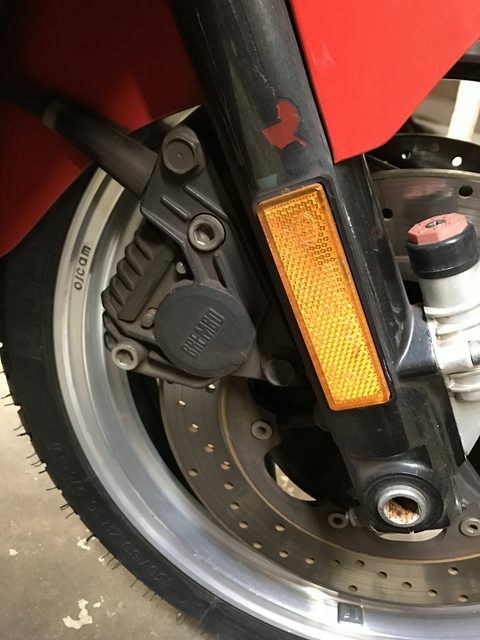 A gentleman on the forum has led the way in replacing stock bulbs with l.e.d.s. Something You and I should do down the road. I do not, as a habit, use the on/off switch. Why should we put any wear on that old switch? Instead, I use the key to energize the ignition on the bike, and I use the key to kill the ignition. A habit I got from driving automobiles. You can also use Golden Tyres I had a set on my Paso and they are quite good. I'm from the USA and also ride a 250 Ninja. Get rid of those old, slippery Michelins ASAP!!!! I've been using Shinkos and love them. Change your cam belts too, it's not that hard. Great buy!